From career transition expert and bestselling author Ines Temple comes a concise, practical guide for job-seekers, career-changers, and career-builders on how to manage your career like a business with YOU as its most valuable asset. Organized into 5 digestible chapters, You, Incorporated is a practical guide to career success that zeroes in on 3 essential concepts that job-seekers, career builders and career changers need to know: No Job is Forever, Employability Equals Options, and Your Career is Your Business. In a refreshingly clear, no-nonsense style, Ines shares the lessons she has learned advising and coaching thousands of people to help them find their own "job utopias." In You, Incorporated, readers will find a down-to-earth, accessible approach to becoming more valuable to current employers while developing long-term personal competitiveness to attract future employers and seize new opportunities! 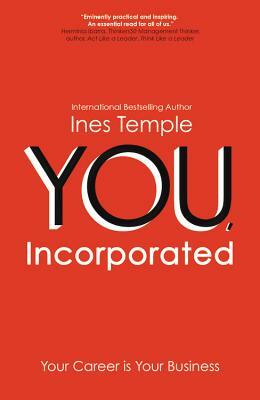 Ines Temple is a career transition expert and best-selling author with a proven track record of success building her own platform and generating widespread interest in (and sales of) her Spanish-language book, Usted S.A. Empleabilidad y Marketing Personal, now in its fifteenth printing with over 100,000 sold. Ines has a robust social media presence with over 95,000 Facebook followers, 27,000 Twitter followers and nearly 30,000 LinkedIn followers. She has been recognized as among the top 30 business leaders in her home country of Peru and is among the top 3 business leaders, male or female, with the most online influence. She is a popular speaker at conferences and universities around the world and a guest columnist for several gobal magazines and newspapers with over 450 articles and video blogs published. Ines is an active member of YPO-WPO an international network of 25,000 top CEOs and other business leaders.